Belper's Green Christmas set to be a hit! Following a very successful meeting at No. 28 in Belper, where the leader of the Green Party of England and Wales spoke to a packed house, we return this Saturday (29th November) for our ‘Green Christmas’. The Mid-Derbyshire Greens would like to invite everyone to an afternoon of music, crafts and refreshments from local residents. Come and do a bit of local Christmas shopping, and enjoy some music from your candidates, Green Party members, and other local musicians. There will be an opportunity to chat to us on the Green Party info stall and to ask any questions that you may have. Belper’s Green Christmas set to be a hit! 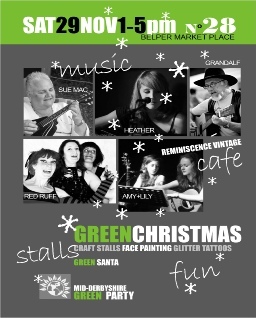 Come and enjoy our ‘Green Christmas’ event at No.28 at Belper Market Place on Saturday, 29th November between 1pm & 5pm. We’ll have live music from Red Ruff, Amy & Lilly and others including ‘spots’ from your local Green Candidates!! There’ll be refreshments from Reminiscence Vintage, craft stalls, face painting and, of course, information about the local and national Green Party … there may even be a visit from ‘Green Santa’!